The French government has selected two national consortia for two tidal energy projects in the Raz Blanchard area. The move follows a call for expressions of interest by the French Environment and Energy Management Agency (ADEME) in September 2013. A consortium comprising EDF Energies Nouvelles and DCNS (OpenHydro parent company) has been selected to install seven 2MW tidal turbines in the Raz Blanchard, off the French coast of Normandy. The turbines, which will have a combined capacity of 14MW, are scheduled to be connected to the power grid in 2018. OpenHydro chairman and DCNS director of the marine energy and infrastructure division Thierry Kalanquin said: “The selection of this project by ADEME gives a further push to the development of a French tidal energy industry, for which Cherbourg will be the driver. 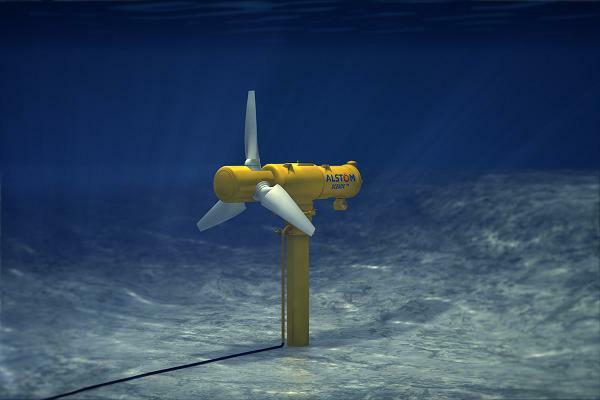 Meanwhile, Alstom, together with GDF Suez, has been selected to install four Oceade18 1.4MW tidal turbines and an electrical subsea hub at Raz Blanchard. The tidal turbines, which will have a combined capacity of 5.6MW, will supply enough energy to 15,000 people. Expected to become operational in 2017, the sea-based project will operate for a period of 20 years. Image: Alstom, together with GDF Suez, has been selected to install four Oceade18 1.4MW tidal turbines. Photo: Courtesy of Alstom.